1. If you were given 1 million pounds – how would you invest that in your business? I would use it to grow faster and to open overseas offices/warehouses immediately, where we know we have demand waiting for our brands. 2. If you were prime minister, what would be the first thing you would change or improve for manufacturers? 100% Capital Allowances up to say £2m. 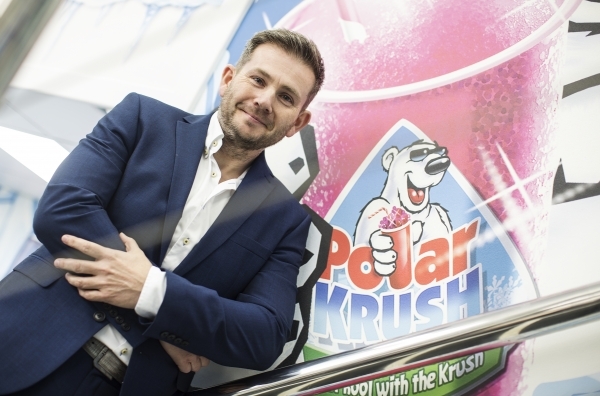 I would also like to reinvest 100% of profits back into Polar Krush to create more jobs; I think this would be a very sensible policy as it results in more tax paid down the road! 3. What’s one thing you have implemented in your business that you would encourage other manufacturers to embrace and implement? My proudest career achievement has to be steering the company through the recession, keeping everyone employed when our bank decided to not support our sector any longer. 5. What drove you to pursue a career in manufacturing and how old were you? I was 23 when I started the business, and I was driven to make a different and better product for consumers. Our competitor made a slush product where you sucked all the flavour out, leaving you with a cup of ice. After trying one, I knew we could do something better! 6. If you could choose, what would you like your legacy to be once you retire? I would like our team and the company to have created the largest iced drinks brand in the world. A brand which is fun, nutritional and has longevity. 7. What’s the best piece of advice you have ever been given? The best piece of advice I have ever been given is to keep looking at the big picture and use your gut instinct. 8. What is your morning routine once you arrive at the factory/office, does this depend on the day of the week it is? I have a habit of checking emails in the car park when I pull up on my phone, so I can prepare for what I will be asked on my way to my office and if I need to support any staff. I usually have 5 mins (no more) with each person that reports into myself and then I let them get on with their jobs. I usually try to focus on the strategy and future as I have a great team – the day to day business is run by the management team, some days I even think I could easily make myself redundant! As automation increases and labour and transport costs rise, I think we will come 360 and business will be more and more localized. Pick a company with a strong brand, longevity of products and a history of developing people. 10. What is your view on post Brexit Britain – positive, negative or indifferent and why? I am positive by nature so hoping we will have an opportunity to trade more with other countries that the EU struggled to get good trade deals with. I think we have to wait and see, it is such a complex issue – I have a feeling it will 2029 not 2019 when a deal is reached and the present arrangements will continue for some time.